No matter your political beliefs or party affiliation, you can rejoice at what Congress did Monday and Tuesday. Unless you enjoy eating shark fin soup. Essentially, Congress outlawed shark fin soup. Or at least it outlawed shark finning, the practice of cutting off the shark’s fins for soup and throwing the rest of the shark overboard to die. Congress passed shark conservation legislation that closed loopholes that had allowed the lucrative shark finning trade to continue thriving off the West Coast, the Washington Post reported Tuesday. 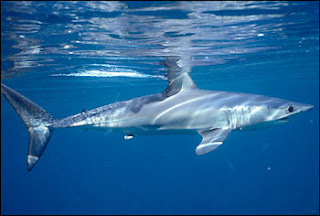 According to the Post article, shark finning is banned off the Atlantic Coast and the Gulf of Mexico but not the Pacific. The new measure by Congress requires any vessel to land sharks with their fins attached, and prevents non-fishing vessels from transporting fins without their carcasses. "Shark finning has fueled massive population declines and irreversible disruption of our oceans," said Sen. John F. Kerry (D-Mass. ), the bill's author, in a statement. "Finally we've come through with a tough approach to tackle this serious threat to our marine life." Both Del. Madeleine Z. Bordallo (D-Guam), who sponsored the House version, and Rep. Doc Hastings (R-Fla.), spoke in favor of the bill Tuesday before it was adopted under suspension of the rules. It now awaits President Obama's signature. "Some things are just worth waiting for," said Michael Hirshfield, chief scientist for the advocacy group Oceana. "Now we can all be a little less afraid for sharks." "The bill was snatched from the jaws of defeat," said Matt Rand, who directs global shark conservation at the Pew Environment Group, adding that it would help federal officials when they negotiate for stricter global catch limits. "It gives the U.S. a further leadership role and mandate to push for shark conservation from other countries." Great news for Republicans, Democrats, Independents, conservationists, and lots of sharks. And to those lovers of shark fin soup, try chicken noodle. Follow Outdoors720 on Twitter at @outdoors720.